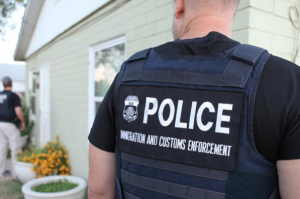 If you were to see an Immigration and Customs Enforcement (ICE) agent today, that agent would probably be wearing a jacket or vest with the words “POLICE ICE” written in over-sized, all capital letters. If that ICE agent were to knock on someone’s door, that ICE agent wearing a jacket saying “POLICE ICE” could and may identify themselves as “police.” Most reasonable people would think an officer wearing a jacket saying “POLICE” who identifies themselves as “police” is in fact a police officer – but ICE agents are not police officers – they have just been permitted to say they are. While the practice of ICE agents misidentifying themselves as police is not new, it is an unsettling and confusing practice. On April 6, 2017, Rep. Nydia Velazquez (D-N.Y.) introduced H.R. 2073 to amend section 287 of the Immigration and Nationality Act to prohibit ICE agents and officers from wearing clothing or other items bearing the word “police.” The bill comes after the ramp up in fear that immigrant communities have experienced since the start of the Trump administration, which has enacted sweeping new guidelines concerning who is a priority for removal. In short, anyone without valid legal status is now fair game. The days of prioritizing criminal aliens over individuals with deep roots in the community are long gone. This sharp change in priorities has empowered ICE agents to more aggressively pursue and detain undocumented aliens, which leads them straight into immigrant communities. For years, immigrant communities have feared to reach out to local police over concern they will be reported to federal authorities for deportation. While this lessened after the emergence of sanctuary cities and the introduction of removal priorities seen during the Obama years, the fear is now reasonably back. The practice of ICE agents misrepresenting themselves as police only further reduces trust in law enforcement and makes immigrants less likely to reach out to local law enforcement to report crime, a much-needed element of successful community policing. The likelihood of Rep. Velazquez’ bill seeing the light of day in the Republican-controlled House is slim to none, but the importance of the message the bill carries is worth the introduction. At a time where fear is rampant in the immigrant communities and uncertainty blankets the landscape, the dissemination of correct information becomes vitality important. It is also vitally important for immigrants to know what rights they have. Since I am an immigration attorney, I feel a duty to inform the public about their rights in these times of uncertainty and confusion, as there is no reason to misinform or conceal information concerning legal rights. Thus, if you are stopped by an ICE agent or an ICE agent knocks at your door, ask them if they have a warrant signed by a judge. If the ICE agent does not have a warrant signed by a Judge, you may refuse to open the door. An administrative warrant of removal from immigration authorities is not enough. If the ICE agent does have a warrant, say nothing further and contact a lawyer. If the ICE agent does not have a warrant, but forces themselves in, state that you do not consent, say nothing further, and contact a lawyer.